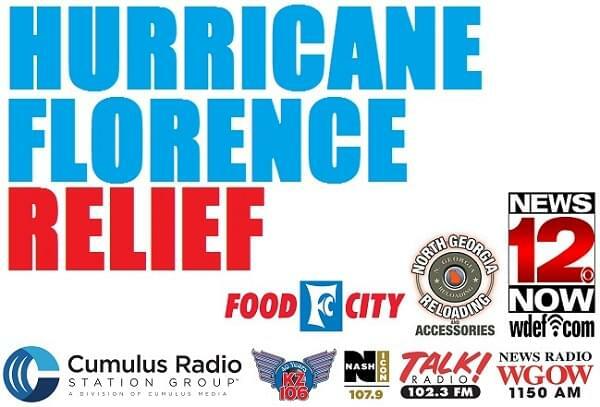 Join us, along with our partners at News 12 and North Georgia Reloading Relief, for a Hurricane Florence relief supply drive at Food City in Fort Oglethorpe, this Friday, Saturday, and Sunday from 10am to 7pm. On Friday only, from 1pm to 7pm, you can also drop off at Food City in East Brainerd. We’ll be collecting non-perishable food items, water, and everyday necessities, especially tooth brushes, toothpaste, toilet paper, feminine hygiene products, baby food, formula, diapers, clothing, blankets and towels.